Savvy crappie anglers are all aglow about the latest lure craze. Lure manufacturers have tinkered with glow-in-the-dark baits and attractants throughout the years, but the concept never seemed to gain much momentum until touring pros and guides started revealing their successes with glow lures and jigheads. Tournament successes with glow lures have converted six-time national crappie champion Ronnie Capps into a glow advocate. "I let the fish tell me that a long time ago," he says. "I've been fishing with nothing but glow the last five or six years." Glow lures are available in a range of colors. 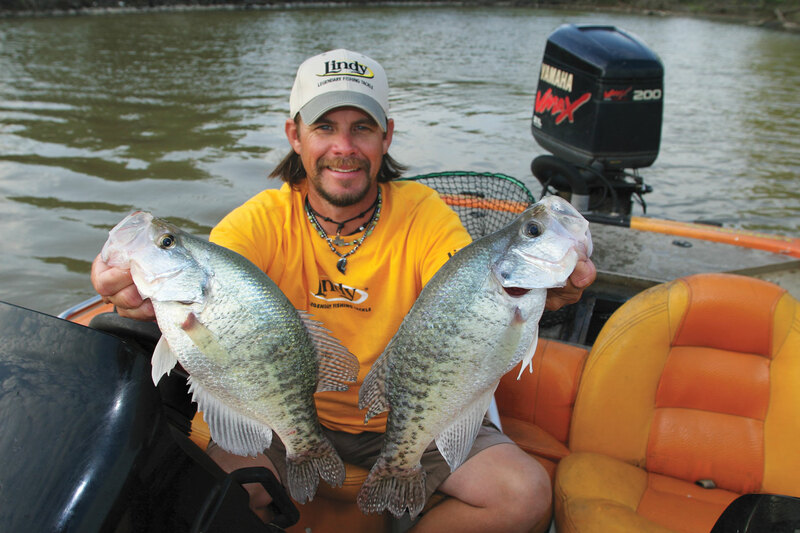 Dr. Keith Jones, Berkley's director of fish research, thinks crappie can discern certain glow hues better than others. "Crappies are like bass and bluegill in that they have a truncated cone spectrum," he says. "Our eyes have cone cells that detect red, blue, and green, but they have cone cells that detect only red and green, so their visual sensitivity in the blue and violet ends of the spectrum is weak. They are far better at discriminating reds, greens, and chartreuse than they are blues, purples, and violets. So as long as the wavelength a lure releases lies within the individual spectrum of a crappie (red, green, and yellow), then the fish should be able to see it when everything else would be dark." White glow lures also are easier for crappies to discern in low-light conditions. "White reflects a broad spectrum of wavelengths which with our eyes translates to white; but I'm not sure what that translates to the fish," Jones says. "Crappies can see white and it would be easily distinguishable from objects that have a true color." Glow baits can be found in the tackle boxes of the nation's top crappie tournament competitors and fishing guides. Here's what's inside. South Carolina pro Whitey Outlaw is credited with helping the lure company design its line of glow lures and jigheads. "They work everywhere in the U.S.," he says. "They are something different that the fish can see." The tournament veteran's favorite glow color is the Outlaw Special, a combination of lime with chartreuse, which he likes to use in clear water during low-light situations. He opts for the 3-inch Bobby Garland Slab Slay'R and Stroll'R in glow colors and attaches the soft plastics to the Mo' Glo jigheads. Outlaw says the Mo' Glo lures helped him and his partner win the 2010 Crappiemasters Alabama State Championship on the Alabama River. "We practiced a couple of days with different colors and the day before the tournament we put a glow jig on and the fishing unbelievably picked up in numbers." Since retiring from the Bassmaster tournament trail, Ken Cook has been crappie fishing and has discovered the virtues of the glow concept. While fishing on a dirty-water Oklahoma lake in the spring, he caught some crappies on a 3-inch Berkley PowerBait Ripple Shad. "These fish were deep," he says. "They were done spawning and were grouped in depths of about 15 to 25 feet." Since he knew the water would be dark at that depth, Cook enhanced his lure with a white Berkley Chroma-Glow Nibble. The move paid off as he caught several slabs with the addition of the glow attractant. "I think it made a difference in fishing that deep, dark water," he says. This new line of glow baits produced victories for Ronnie Capps and Steve Coleman at the two-day Crappie USA Mississippi Super Event and the one-day Crappiemasters tournament at Reelfoot Lake. The glow tubes work best for Capps in dirty water conditions, but he's caught crappies on these lures in clear water at Reelfoot Lake during March and April before the vegetation started growing. "We were casting in water that was 11â„2 to 2 feet deep and did really well with them," he says. Southern Pro offers 11â„2- and 2-inch glow tubes in 26 colors with most of the lures containing a dash of chartreuse. Capps has a lot of confidence in chartreuse. Three glow hues (white/pink, glow, and black/glow tail) are available on the 1- and 11â„2-inch Charlie Brewer Slider Grubs and Charlie Bee. The Whirly Bee also comes in a black glow-tail hue. "During the day, the sun charges the glow tail, so when you fish deeper where it's darker, the tail glows and at times that attracts fish," says Charlie Brewer Jr. "It offers a different type of attractant." Slider grub fans also use the glow version at night to help crappies better see the offering. "A lot of anglers charge the lure using a flashlight, fish it for a while until the glow dies, then recharge." Minnesota guide Brian Brosdahl selects a glo-rainbow 1/16-ounce Fire-Ball Jig tipped with a minnow or a piece of nightcrawler to catch crappies from weeds in clear-water lakes. "I take a half of a crawler and fold it in half and put it on the jig," says Brosdahl, whose clients catch numerous fish in early summer on the glow-jig-and-worm combo. "The glow Fire-Ball gets their attention as it falls in the weeds. The crappies are belly to the bottom and come up to eat it. We use them under slipbobbers with a barrel swivel about 2 feet above the jig." When fishing the stained to murky waters of Lake Eufaula, Oklahoma, guide Barry Morrow relies on glow jigs and soft plastics. He frequently fishes with a double rig consisting of a standard colored soft plastic on a Lindy XChange System jighead or standard Lindy Jig in a glow hue, and something like a Lindy Little Nipper in glow or a Fuzz-E-Grub. "If I am using the Fuzz-E-Grub on the bottom of my rig, I go with a glow jig on top" he says. The XChange jigs, which allow instant changes of jighead sizes and color without retying, are available in six glow colors. Morrow's favorite glow tints are Patriot (white, blue, and pink) and Bubblegum (pink, white, and orange). The Lindy Jig comes in 4 glow colors: glow, pink-glow, blue-glow, and green-chartreuse glow. Little Nippers, hand-tied with feather tails, are available in chartreuse glow and pink glow. A combination of a Lindy glow XChange jig head and a glow Yum Vibra King Tube works well for Oklahoma guide Todd Huckabee whenever he encounters green water. "I use those any time the water has a green tint because when the water is that color the shad almost have an iridescent glow," he says. "If the water is clear, the shad have a silver color. The glow jig really seems to shine when there are shad fry around trees." Huckabee always uses XChange glow heads with non-glow soft plastics in muddy water (3 inches or less of visibility) and on cloudy, windy days in clearer water. The Roadrunner glow head has been a key to Coy Sipes' success in national crappie tournaments. The Alabama guide and touring pro trolls shallow murky water with double rigs that include a 1/4-ounce Road Runner glow head with a glow or standard color plastic body tipped with a minnow. He sets a minnow on a hook about 2 to 3 feet above the Road Runner. Pink and chartreuse glow Roadrunner heads trolled 3 feet deep in the weeds at Grenada Lake produced a fifth-place finish for Coy and Gilford Sipes in the 2010 Crappiemasters Mississippi State Championship. "All of the fish were coming off the bottom lure (the glow rig)," Coy says. John Neporadny Jr., Lake Ozark, Missouri, is a veteran outdoor writer and contributor to In-Fisherman.